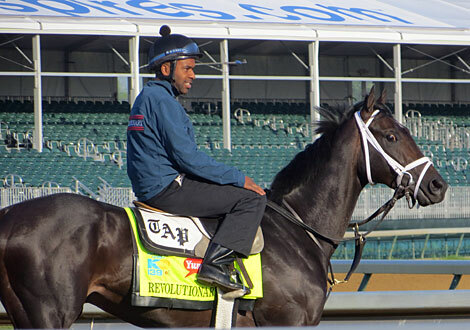 What better way to kick off live Kentucky Derby coverage than with a photo gallery of some of the major players and some early observations. Thursday and Friday have been sort of the calm before the storm, literally, as beautiful crisp weather is expected to turn a bit nasty over the weekend when the majority of final works are scheduled, especially on Sunday, which promises to be a hectic 15 minutes from 8:30 and 8:45. There actually were three works Friday – Vyjack, who went five furlongs in 1:00 2/5, with a final quarter in :24 2/5, out six furlongs in 1:14; Falling Sky, who drilled six furlongs in 1:13 in company with two workmates, out seven panels in 1:28; and Golden Soul, who went five furlongs in 1:00 4/5, taking a little while before changing leads. 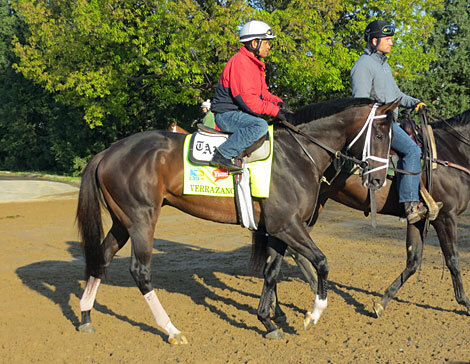 From a physical standpoint, Verrazano is a standout; a big handsome powerhouse of a colt, whose coat is resplendent. He appears to be an easy-going horse who goes about his business like a pro. Verrazano has been galloping smoothly, and like most of the Pletcher horses, not being asked for anything too strenuous, especially with the final work coming up in a couple of days. Unlike the hulking Verrazano, Revolutionary is more light-framed and refined, and is built like a true stayer. He seems very intelligent and does whatever he’s asked to. From all appearances he looks like the kind of horse you’d love to train. Revolutionary has been putting in steady gallops each day. 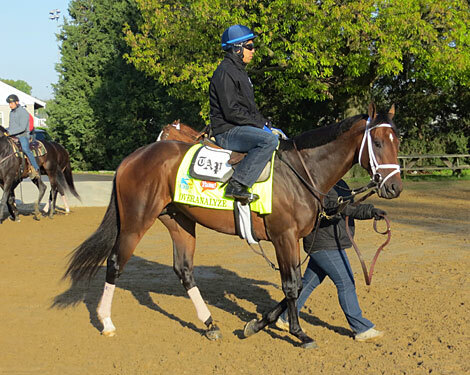 Nothing flashy about Palace Malice. He just looks like one those blue-collar horses who is just now coming around to peak form. We have no idea how good this colt really is, because he hasn’t been given the opportunity to show his best. The well might be deeper than many people think. Orb has one of the most attractive, alert heads and is very interested in the goings on around him. He seems to be feeling good and the way he briefly shied from the pony this morning, he would appear to be the type of colt trainer Shug McGaughey will school in the paddock several times. A powerfully built horse, Vyjack definitely is the aggressive type, at the barn or on the track, and can be a bit ornery. In his work this morning, he had his ears pinned from the start and even while galloping out, and had to be being strongly encouraged by trainer Rudy Rodriguez down the stretch, according to veteran observers. If ever a horse would seem to have benefited from a little down time at Fair Hill and several visits to the hyperbaric chamber it is Vyack. It’s obvious he came to Churchill Downs looking for action. 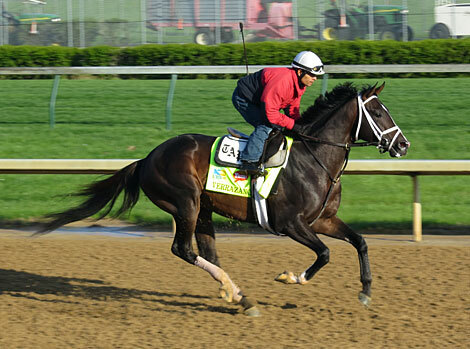 Fortunately, he’s been more professional in his races, and he better be on Derby Day. Overanalyze is just one of the crowd among the Pletcher brigade, who is not going to make you sit up and take notice, but those are the types that often make the most noise. Many people are dismissing him because of the slow time of the Arkansas Derby, but that could prove to be a costly mistake. This colt should never be taken lightly, as he has accomplished too much in his career, from winning at five furlongs in his career debut to winning grade II stakes at 1 1/8 miles at 2 and 3. If you’re looking for a high energy horse, you won’t find one more high energy than the compact Oxbow, who is pretty much a coiled spring, as evidenced by the photo above. If any horse is due for some good luck at the draw and the start, and the entire running for that matter, it is him. 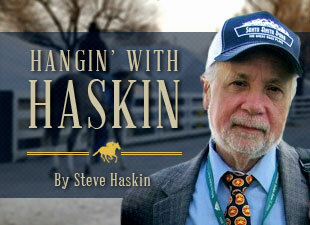 You can bet Gary Stevens will be much more familiar with him this time. 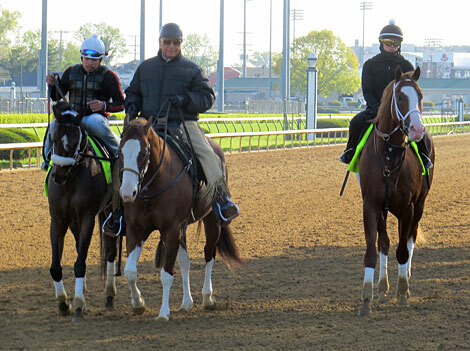 Oxbow and Will Take Charge return from their gallops escorted by trainer Wayne Lukas. They may be stablemates, but that’s where any similarities end. They are totally different both physically and mentally. Lukas has always been touting Oxbow as something special, but he welcomes the challenge of getting Will Take Charge to the Derby in top shape off an unprecedented seven-week layoff. 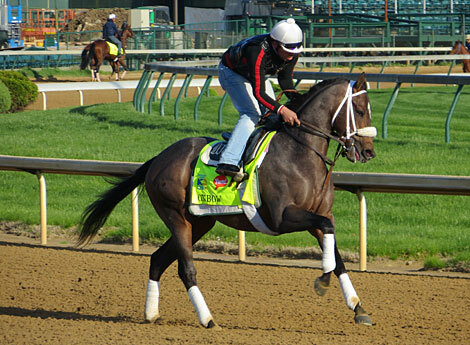 He feels he’d rather have the big, long-striding colt, who is still maturing, go into the Derby fresh. 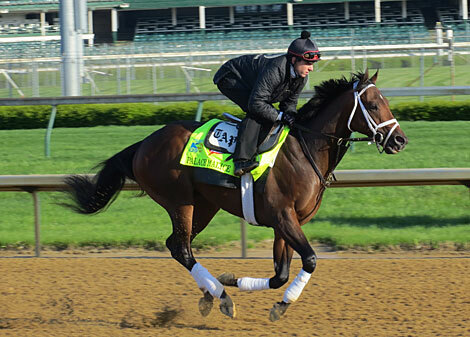 No one has been galloping stronger than Normandy Invasion, who seems to be coming into the Derby in peak form. 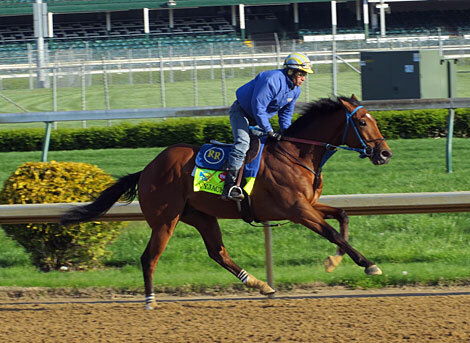 Each morning, he rolls around there at a good clip while galloping out near the middle of the track. It wouldn’t be a surprise to see him closer to the pace than most people think. He has already shown he can close off a fast pace or a slow pace, and it is important that he make his move on the far turn, as he did in the Remsen, and not wait until the final sixteenth to give that big burst. 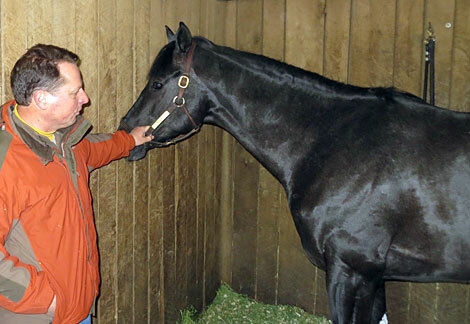 Tom Amoss proudly shows off Mylute, who goes out very early each morning. He is an extremely well-balanced colt, who looks like his sire Midnight Lute, although not quite as imposing. He is a solid longshot play who definitely is on an upward spiral. Java's War has to be the smallest horse in the race, standing no more than 15.1 or 15.2 hands and weighing no more 950 pounds. He’s been skipping over the ground smoothly each morning and will have his final work in company with fellow Derby starter Frac Daddy. The question with him is getting through that 20-horse field. But it won’t take a large hole for him to slip through.